Experience an unforgettable journey around the island of fire and ice. Iceland is a country of contrasts and the diverse natural landscape provides the possibility for unique experiences like nowhere else on earth. This cruise reveals both natural wonders and the Icelandic way of living. A range of exciting shore excursions brings the unique character of Iceland closer to you. This voyage reveals a diverse array of natural wonders and the Icelandic way of life, and we will also visit Grimsey, just north of the Polar Circle. 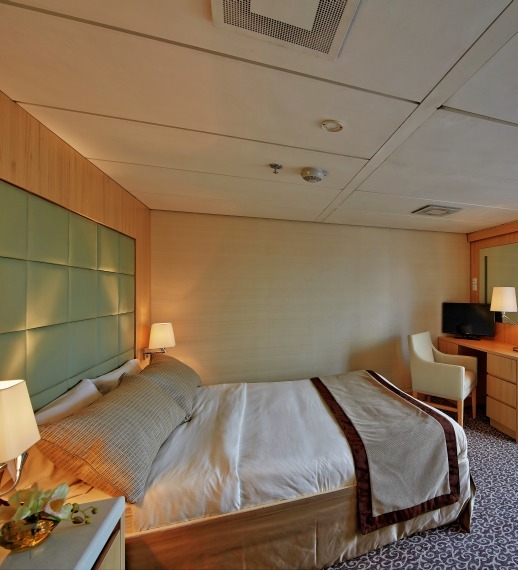 Make a complete circumnavigation of Iceland on the Ocean Diamond, the ideal vessel for this cruise being large enough to be very comfortable, but small enough to get into the smaller bays and harbours. Heading clockwise from Reykjavik, we'll cruise to the Snaefellsnes Peninsula, which juts out from Iceland’s west coast, Siglufjördur, once the centre of the Icelandic herring industry, Akureyri and nearby Lake Myvatn, the stunning Seydisfjördur, Höfn and the Vatnajökull glacier and the Westman Islands. Use your leisure time in Reykjavik to discover the unique charm of the world’s northernmost capital. The OCEAN DIAMOND docks in Old Reykjavik Harbor in the heart of the city, a five-minute stroll from the main squares, shopping and dining. The ship departs in the evening. Stykkisholmur is the starting point of our adventures on the Snaefellnes Peninsula. Often called “Iceland in Miniature” because of its it diverse landscapes, the area is home to bird-rich Breidafjördur Bay and Snaefellsjökull glacier, which sits atop a 700,000-year-old dormant volcano that was featured in the Jules Verne novel Journey to the Center of the Earth. Today‘s destination is Isafjördur, an idyllic town in the Westfjords region. This secluded peninsula is connected to the Icelandic mainland by only a narrow strip of land and includes many roadless areas where cars have never been. The landscape includes jaw-dropping views of dramatic fjords carved by ancient glaciers, sheer table mountains that plunge into the sea and pristine North Atlantic vegetation. By morning we reach the fjord town of Siglufjördur, once the hub of the global herring industry and now enjoying a rebirth in popularity. Learn about the golden age of herring at the award-winning Herring Era Museum located on the vibrant harbor-front. In the early afternoon we head to uninhabited Grimsey Island. Located about 25 miles (40 km) off the mainland on the Artic Circle, the island harbors a variety of bird species including puffins, guillemots and gulls. Later we set sail for Akureyri, Iceland’s lovable second largest city. In the early morning hours we steam into Skjalfandi Bay and Húsavík. Often called the “Whale watching capital” of Iceland, the town’s offshore waters are home to 15 different whale species, as well as dolphins and 30 variety of bird. Watching these graceful ocean giants in their Arctic habitat is an unforgettable experience. After breakfast we bid farewell to the OCEAN DIAMOND as we sail back into Reykjavik. Explore inland areas like the Golden Circle and its famous Gullfoss waterfall via our Air & Ground package or other post-cruise programs. Or simply hang out in Reykjavik, a perfect city for those who want to refresh their spirit in a place that combines invigorating outdoor activities, great food and world-class entertainment. All routes and excursions are provisional and subject to change as weather, sea and ice conditions may affect the itinerary. • Admire black-sand beaches, erupting volcanoes, lumbering glaciers and thunderous waterfalls while at the same time swimming in hot springs, betting on when geysers will erupt, and hiking across barren rocky deserts. • Be introduced to many facets of the island, learn more about the country and its people, wildlife as varied as wild horses and whales, culture and cuisine, stories and legends. • Most cities and towns are located along the coast and can easily be reached by boat. 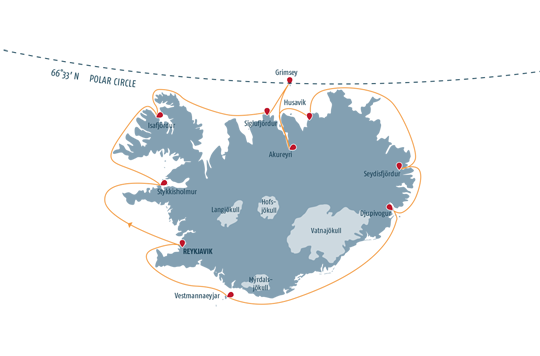 However, our numerous shore excursions give you the opportunity to explore the interior of Iceland as well.